I hit the jackpot this year as my Chanukah present was a TON of chocolates from Lagusta's Luscious. I've never had anything from Lagusta before, so I was pretty excited. For the uninformed, Lagusta's Luscious is run by Lagusta Umani out of a cute little shop in New Paltz, New York. All of the chocolates are made with high quality ingredients that are Vegan, organic and fair trade. 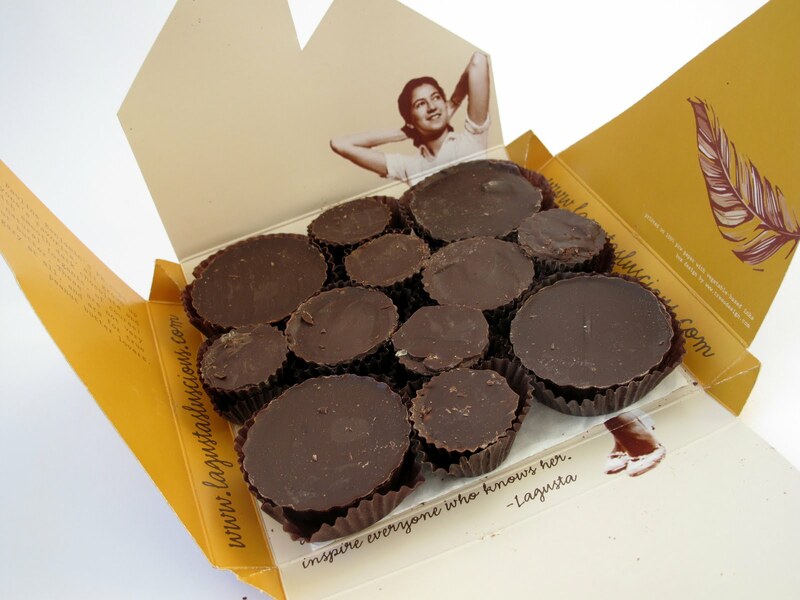 Anything with peanut butter gets my attention and these Pauline Benjamin Peanut Butter Cups sure did. The pb was nice and gooey, almost like a peanut butter caramel. You can see how gooey they were! If you are a pb fiend, you will die over these. Next up are two gourmet chocolate bars, the Caramel Chile Bar and the Smoky Corn on the Cob. 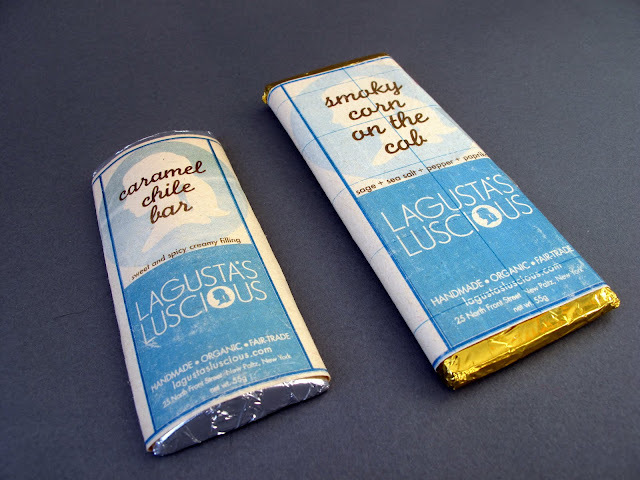 Two non-traditional flavors in a chocolate bar that both turned out to be AMAZING. Caramel Chile had a nice sweet & spicy flavor in addition to a delicious syrupy inside. This is the one for you heat lovers. 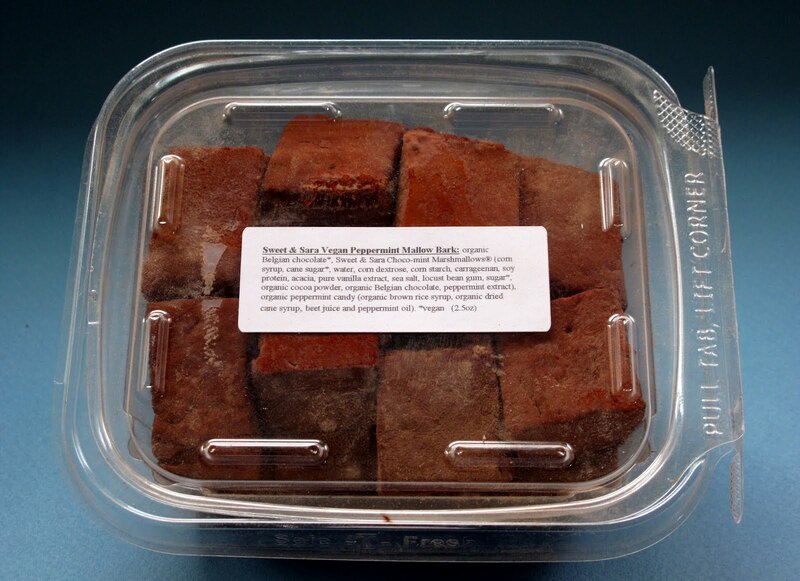 The Smoky Corn Bar was something of a revelation and my favorite of all the chocolates. Corn is one of my favorite foods but I never pictured it could be such a compliment to chocolate and visa versa. 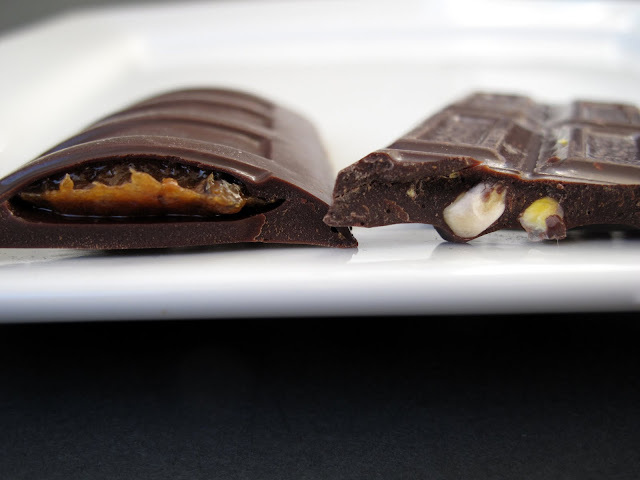 If you take nothing else from this blog post, please buy a couple of these bars and go to heaven. It's that time of year and peppermint and chocolate are everywhere! 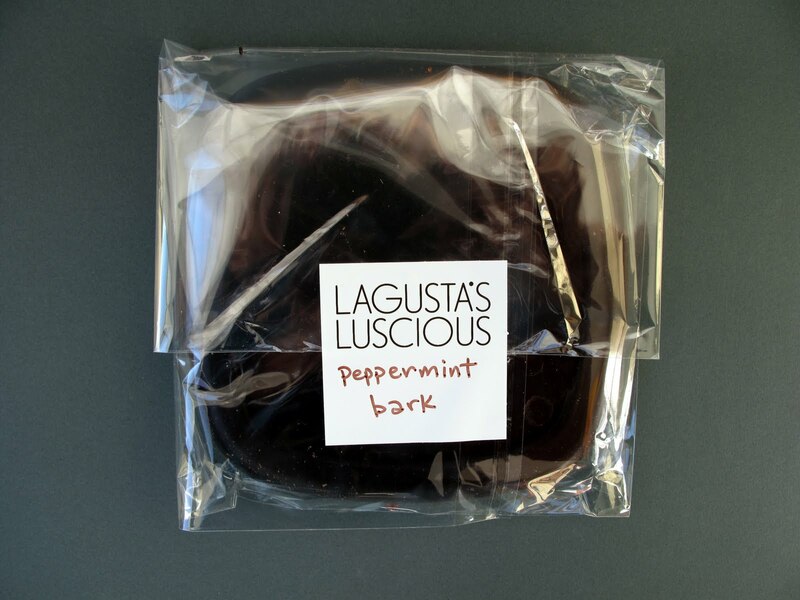 Lagusta's Peppermint Bark is a pound of chocolate with homemade peppermint candy pieces. At first sight, I wondered how on earth I was going to eat a pound of peppermint bark. But after a couple bites I realized a) it's delicious and b) I should share. 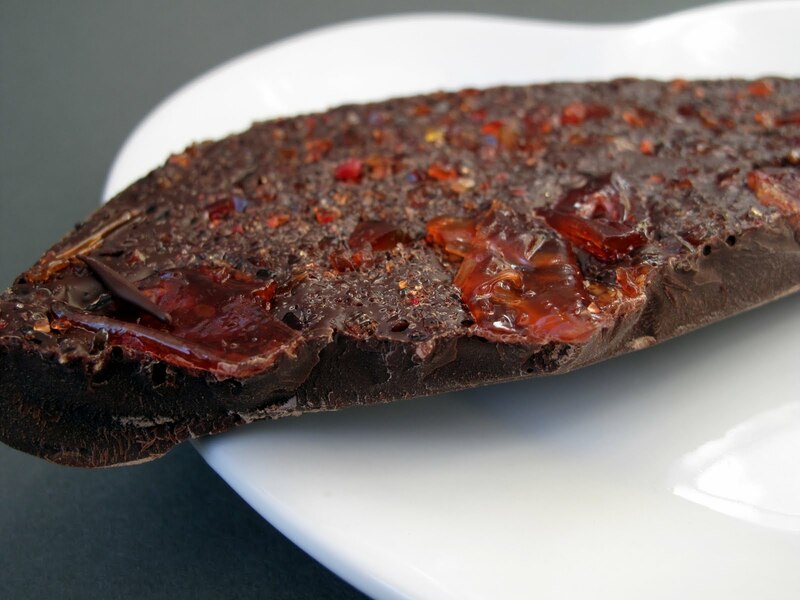 So when you are thinking of sending some chocolate to a loved one, make sure you check out Lagusta's Luscious for amazing chocolates! Christmas is almost here and I couldn't be any happier to get it over with. One positive part of this season has been the abundance of Vegan nogs. 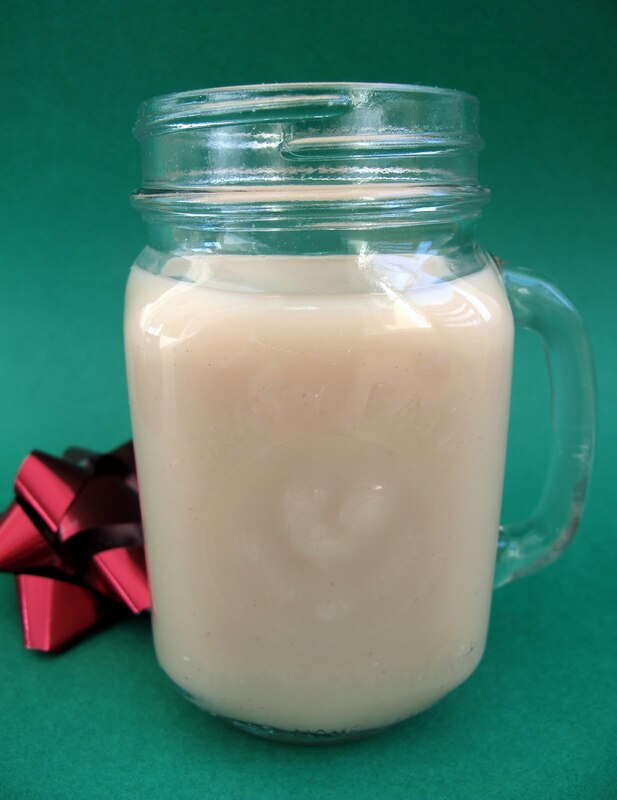 From So Delicious Coconut Nog to Earth Balance Organic Soy Nog and mainstays Silk and Westsoy. 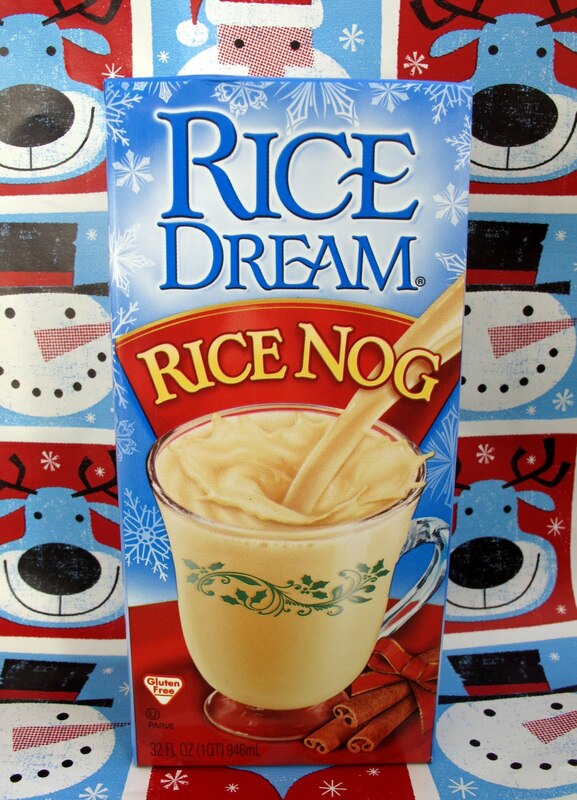 New to me this season is Rice Dream's Rice Nog. At first sip, you definitely taste the spices. I want to say it's almost chai like. The consistency is very thin, similar to soy or rice milk. I thought it was good but I'm not sure if I would buy it again. I personally like thicker nogs and I'm not a fan of rice milk in general. The positive thing in my eyes it that the Rice Nog adds more choices for those with those with allergies. So if you enjoy rice milk and or have a soy/coconut allergy, this is the nog for you. Thank goodness for variety! 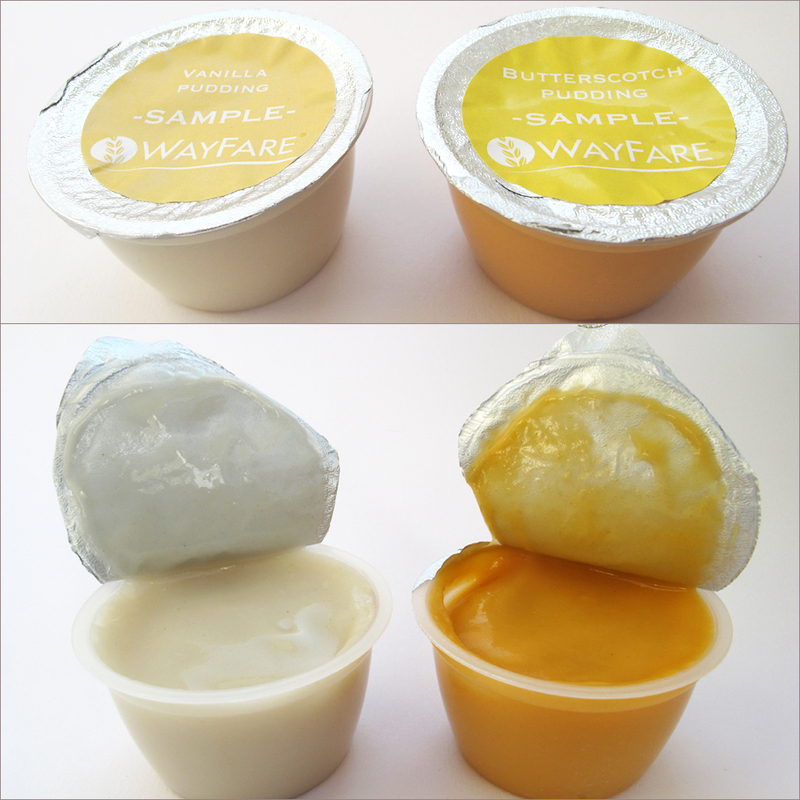 WayFare Foods was nice enough to send their new pudding my way! The three flavors are Vanilla, Butterscotch and Chocolate. The puddings are made from millet, lima beans, rice, oat bran and oats which is amazing to me. So if you need a change of pace from soy or almond, you now have another option for pudding. Me, Veganette and KB had a little taste test. Veganette felt the vanilla pudding tasted like fresh vanilla bean and had a bright and prominent flavor. This was her favorite of the three. I also enjoyed the vanilla flavor and appreciated the creaminess. 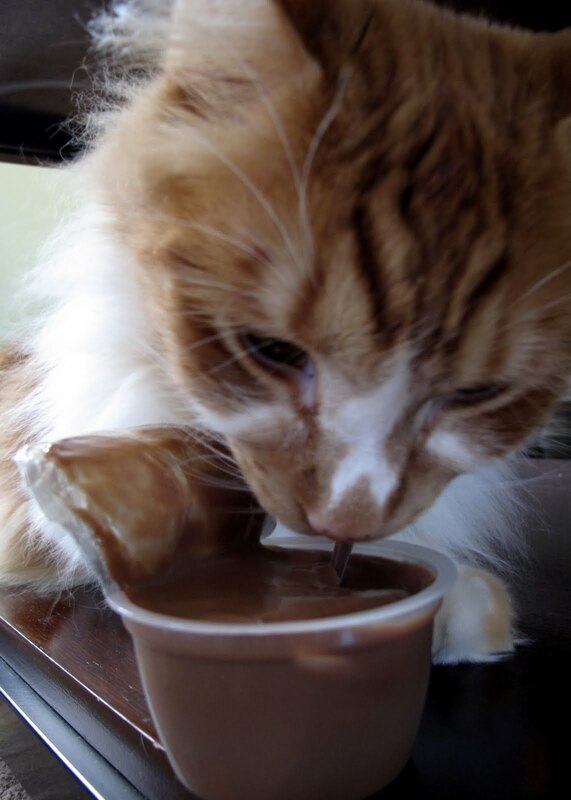 KB licked the empty vanilla cup and said "meow?" The butterscotch was my favorite. Maybe it's because I haven't had butterscotch pudding for so long. Veganette felt it tasted like "buttery cotton candy," in a good way. KB said "lick, lick, lick." 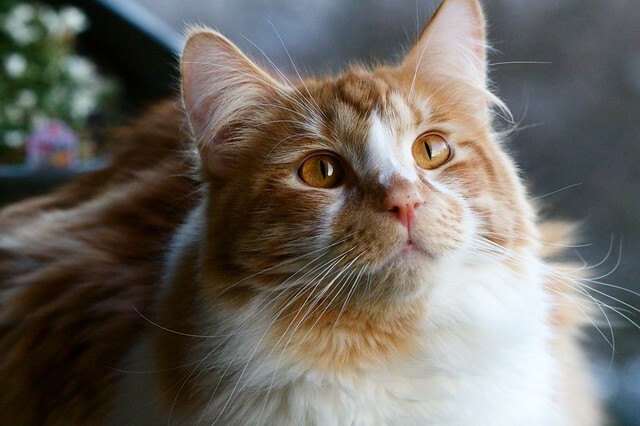 This must be his favorite, most likely because he is the same color as butterscotch. Chocolate was very cocoa-y to me, almost cake batter like. Chocolate in general isn't my favorite but I would try it again. Veganette loved it and felt it tasted like creamy milk chocolate. All KB said was "sniff, lick, sniff." 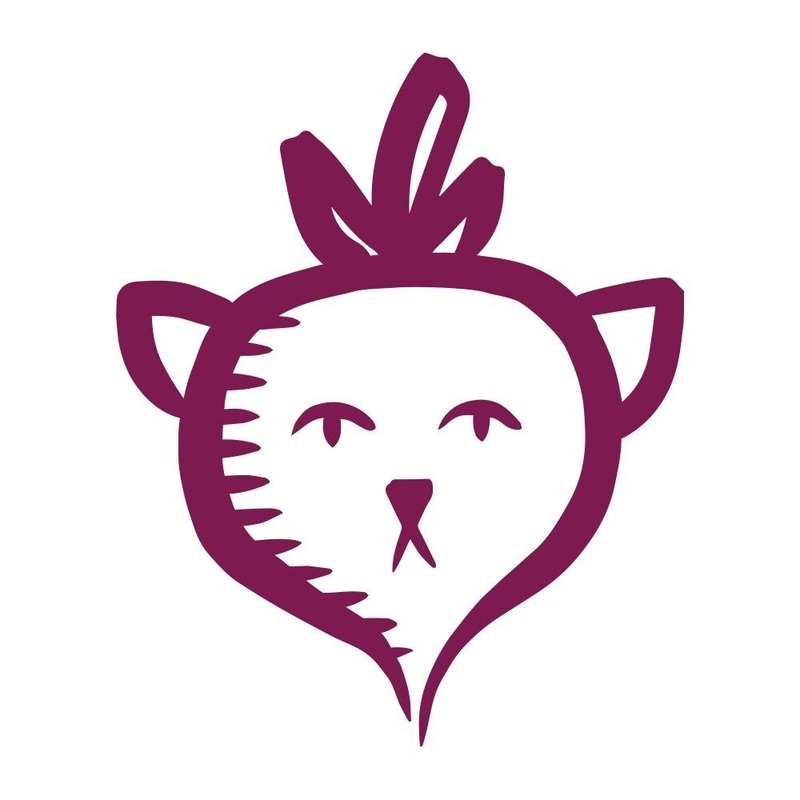 It's neat to see an all Vegan company branch out and try different things. You would never guess in a million years that this pudding has lima beans and millet. Go WayFare! 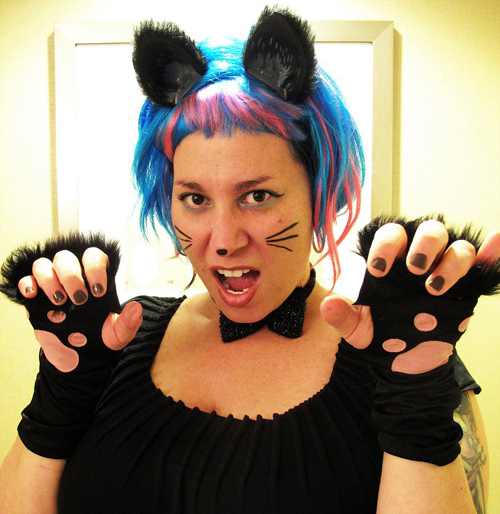 Quarrygirl is the creator of the recently retired Quarrygirl.com. QG provided an amazing blog and restaurant guide for the Los Angeles area and beyond. 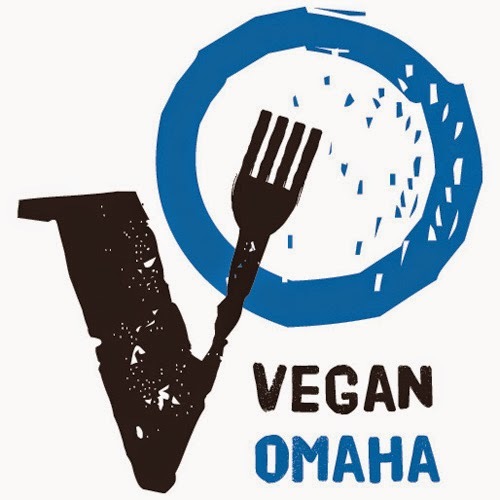 When I started having the idea for Vegan Omaha, Quarrygirl.com was a huge inspiration. 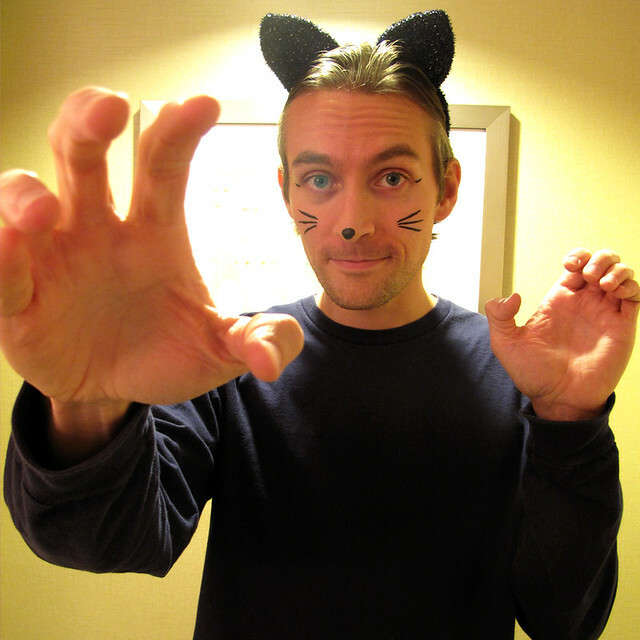 While QG is no longer actively blogging, the blog archives can be found here. Also, she's still spreading the good word via Twitter. So pour a lil' almond milk to the ground for Quarrygirl and check out her favorite Vegan convenience foods! I really don't do veggie burgers at home very often, but when I do, I'm all about the original vegan Boca Burgers in bulk from Costco. They're super cheap, they taste decent, they're easy to make, and they only have like 100 calories in them? How is that even possible? Pretty much anything made by Amy's. My all time favorite is actually a breakfast---does that count? It's the Tofu Scramble with Hash Browns and Vegetables. Lula's in NYC, no question. But if it must be store bought, better pecan by Tofutti! I'm old school. Jalapeno Heat Dirty Chips. I got introduced to these at Ike's Place in San Francisco, and I haven't tried anything better since. I honestly haven't eaten cereal in years, and I don't have a favorite. I prefer my breakfasts heated! 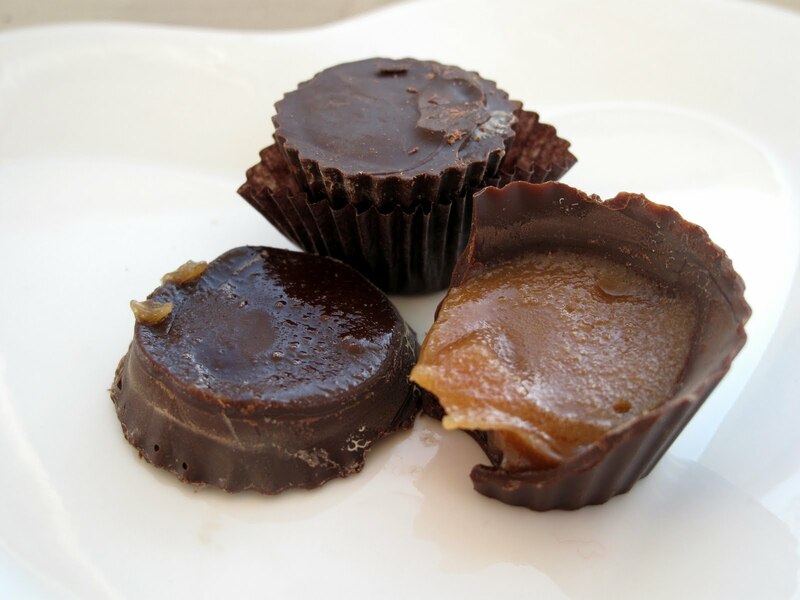 For chocolate based candy, Justin's Dark Chocolate Peanut Butter Cups. For non chocolate, Gummy Summer Peaches by Goody Good Stuff! Alternative Baking Company. Any flavor, any day of the week. Can we pretend I have hot water or a microwave on the island? McDougall Chicken Flavor Ramen---I could eat that forever and never get sick of it. I'd also take some Secret Aardvark habanero sauce because I'm a capsicum addict. And of course, my favorite vegan product, Food For Lovers queso to drink by the jar…and pour into my ramen. You know that pancake stuff at the supermarket that comes in a spray can? I want them to veganize THAT. When that gets veganized, I know we've arrived. In LA, I love Locali and Figueroa Produce. Online, I'm all about Food Fight and Vegan Essentials. And that concludes The Laziest Vegans Top Ten. Thanks Quarrygirl! It's that time of year again. Snow, hot cocoa, runny noses and Christmas. On the bright side, Sweet & Sara has made some adorable holiday treats that every Vegan will love! 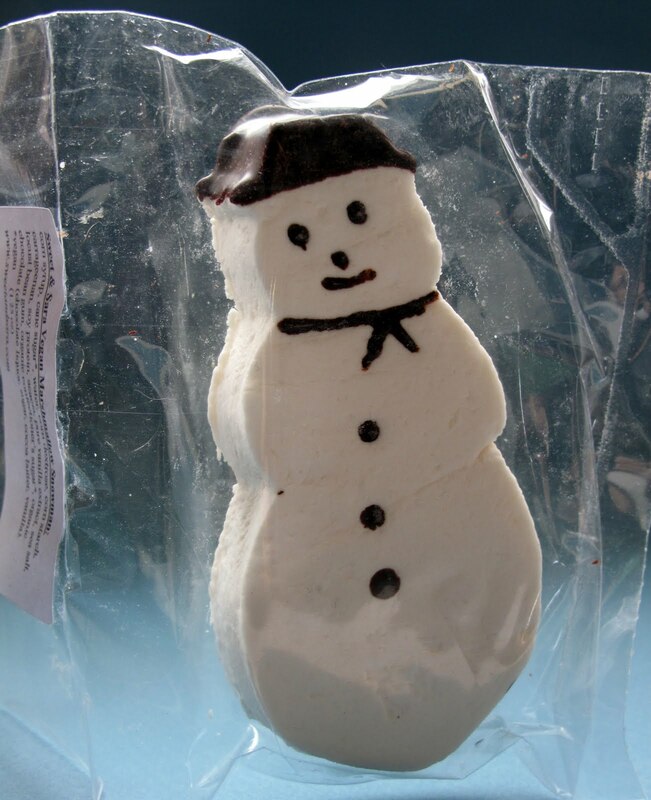 Mr. (or Ms.) Marshmallow Snowman. 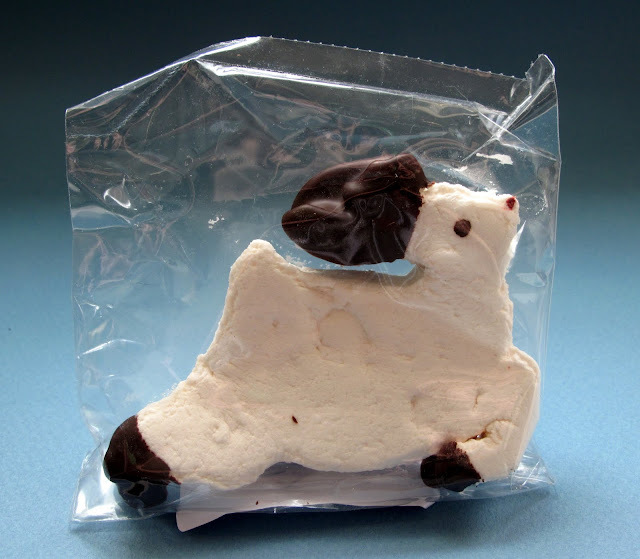 Marshmallow Reindeer. Is it Rudolph? Choco-Peppermint Marshmallows. Silky chocolate delicious cubes of magic! 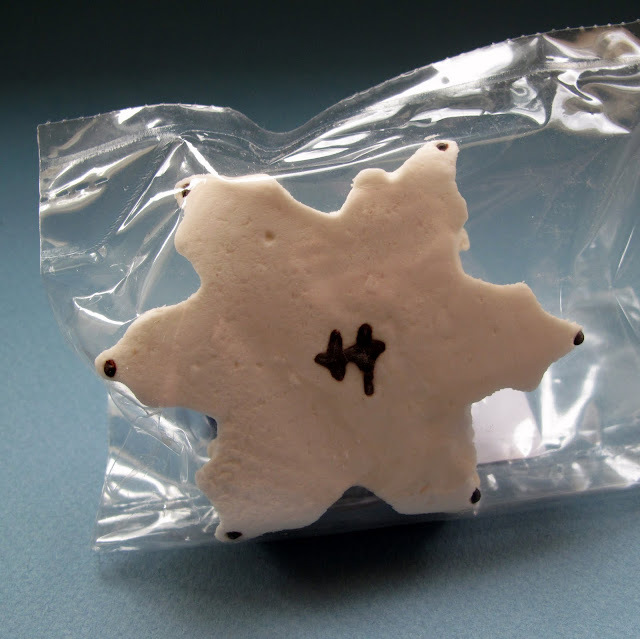 Marshmallow Snowflake. I enjoy the marshmallow version more than the real thing. 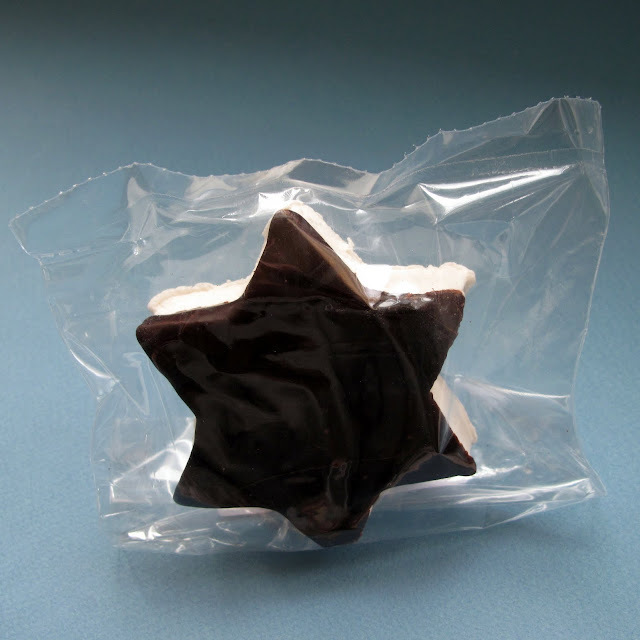 Marshmallow Star of David. So who is David anyway? 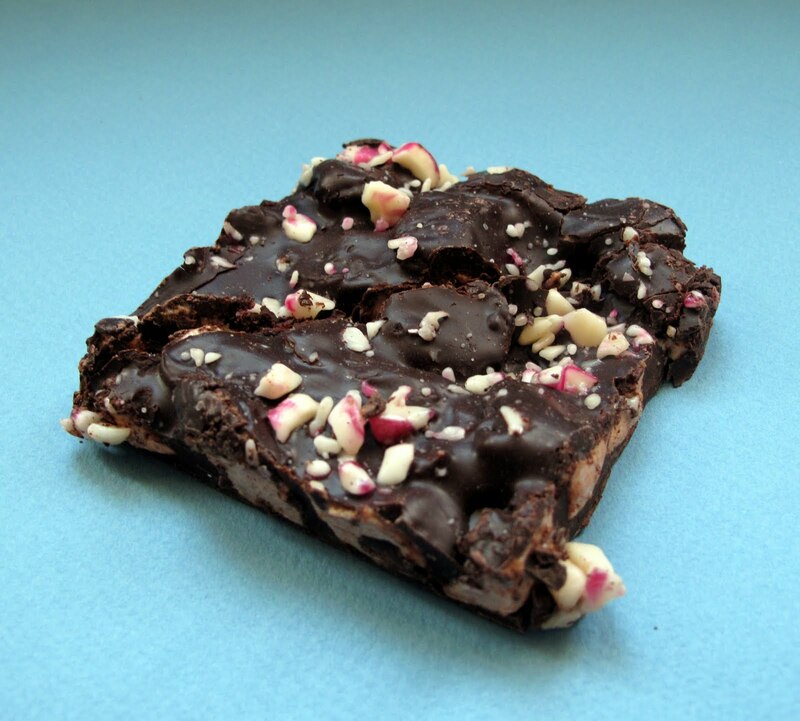 And last but not least is the Peppermint Mallow Bark. It's to die for- the chips of candy cane mixed with the marshmallows and chocolate is just too much.